Lee Min Ho is Coming to Manila + Giveaway! I know a lot of people who loves K-POP and Korean telenovelas (yes that includes you Dad, weird)... wish I was one of them. But the closest thing I ever got to K-POP lovin' was my past obsession over Meteor Garden then slightly over Boys Over Flowers, which brings me here, my knowledge and liking of Lee Min Ho popularly known as Jun Pyo. My family was a huge fan of the show that my brother Joot (who honestly believes he looks like Jun Pyo) changed his facebook name to Joot Pyo. Very original. Haha. It's still his facebook name. Haha. 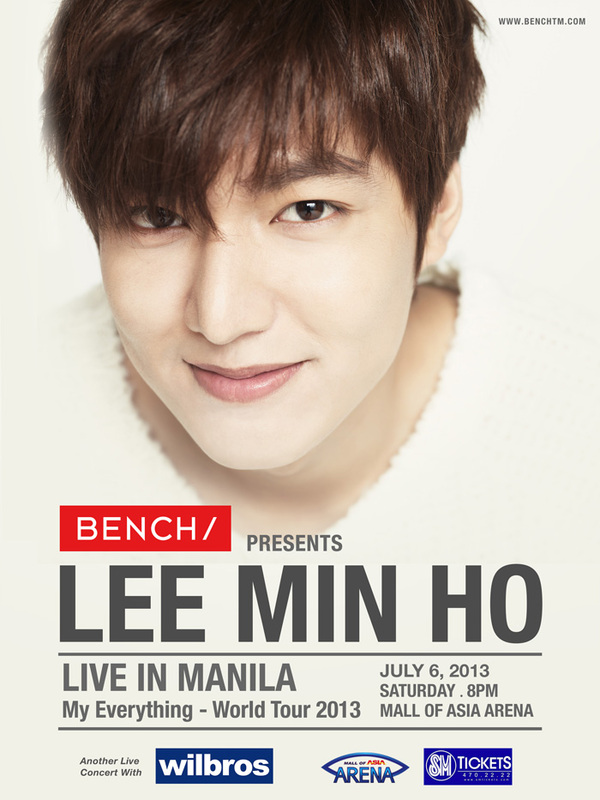 Anyway, speaking of Lee Min Ho, he's coming back to Manila very soon!!! Okay, July 6 to be exact. He's currently doing a world tour and he's bringing it here in Manila! So mark your calendars! “My Everything – World Tour 2013”, Saturday, July 6 at the Mall of Asia Arena. If you happen to be in these cities and countries -- Tokyo, Seoul, Bangkok, Beijing, Kuala Lumpur, Shanghai, Osaka, Hong Kong and the United States-- then don't miss out, he's coming for you too! With the release of Lee Min Ho’s first album entitled “My Everything”, this will be his way of thanking his supportive fans around the world. Despite pessimistic claims from critics that Lee Min Ho’s massive popularity would die down after the Boys Over Flowers craze, the talented actor has proven to be a no one-hit wonder. He continued to star in several blockbuster dramas, including “Personal Taste” (renamed “Perfect Match” in the Philippines) and the action drama “City Hunter”. Lee Min Ho is also one of BENCH clothing’s current international endorsers. Tickets to Lee Min Ho’s “My Everything – World Tour 2013” in Manila are available at all SM Ticket outlets or visit www.smtickets.com. For VIP tickets and more information about the concert, call Wilbros Live at 374-9999 (Follow Facebook.com/WilbrosLive and Twitter @WilbrosLive). Now, 1 of you could win 2 Upper Box tickets to the show!!! 3. Share this giveaway on your blog, facebook or twitter. Don't forget to tag Wilbros & Bench and share giveaway link! Winner will be announced on July 4, 2013. Goodluck!